Glenn Irwin Takes First Win Of The Season, As Haslam Seals Title. The first race of the Brands Hatch GP triple-header which concludes the 2018 Bennetts British Superbike Championship saw Glenn Irwin (BeWiser Ducati) take his first dry win in the championship, and his first of the season, and Leon Haslam (JG Speedfit Kawasaki) claim his first British Superbike title. A front group emerged almost immediately, with Glenn Irwin, pole setter Jake Dixon (RAF Regular and Reserves Kawasaki), Peter Hickman (Smith’s BMW), Tommy Bridewell (Moto Rapido Ducati), Richard Cooper (Buildbase Suzuki), Leon Haslam, Andrew Irwin (BeWiser Ducati) and Tarran Mackenzie (McAMS Yamaha) breaking away at the front. The lead pack was cut by two riders after a couple of laps, as Cooper and Bridewell fell almost simultaneously in Druids, Bridewell gesturing to imply issues with the track conditions. The race continued, though, and the remaining six riders in the front group continued to fight over the lead and the podium spots. Despite a good charge mid-race, Andrew Irwin started to struggle a bit towards the end, and after dropping back from his teammate and brother, Glenn Irwin, he was passed by Dixon, and then pressured by Mackenzie. Dixon pushed on and tried to catch and pass Glenn Irwin on the lead PBM Ducati, but just ran out of time at the end, whilst Taz Mackenzie was able to find a way past the second Panigale of Andy Irwin. Glenn Irwin’s win was sublime. A lights-to-flag masterclass, a ride akin to some of those of his former teammate, Shane Byrne. There was not one moment where he looked at risk on the bike, where he looked as if he was going to throw it all away. Knowing he was going to be leaving the BeWiser Ducati team at the end of this weekend, Irwin was always going to be after a win this weekend, to sign off in a good way. With a victory already, and with two races still to come on Sunday, who’s to say this will be the only one? Second place for Jake Dixon left him disappointed. With his only realistic option for the championship coming into this weekend being to win all three races, that was Dixon’s sole aim, so to miss out in the first one was always going to be a source of frustration and sadness, and combined with the mathematically important sixth place of Leon Haslam, Jake’s reaction was understandable. But with the pressure now completely off, the GP-bound rider can go out tomorrow and ride completely freely. Another podium for Mackenzie proved that he is definitely one to watch for next season, and even for tomorrow. After qualifying, he complained of being not totally comfortable with the Yamaha R1, and it was clear that the situation was very similar in the race, as he had several moments through the race where he lost the rear, notably out of Sheene Curve, and later on again on the exit of Graham Hill Bend. But nonetheless, his pace was strong when he could string a lap together, and some decent changes overnight could put him in a position to take his first Superbike win tomorrow. Fourth place in the end went to Andrew Irwin, who matched his best result of the season so far. The #18 rider has been impressive all season, and the pace he has shown in a circuit which he has already been to on a superbike proves that he has a great potential with the one litre bikes. He doesn’t yet have a berth for next season, but he is certainly writing himself a good CV. Peter Hickman held onto fifth place for Smith’s BMW, but it was the man behind him, Leon Haslam, who stole all the lime light today, as he took his first British Superbike Championship, after an entire career of missing out. 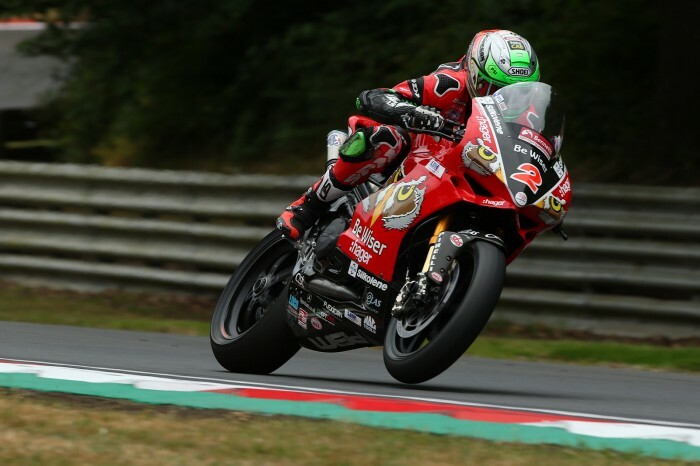 Fourteen wins propelled Haslam to this title, and with him moving to the World Championship for 2019, this is precisely the way he wanted to sign out of this three-year stint in BSB. With the chains of the championship taken away tomorrow, Haslam should be right back at the front, battling for the win in both races. Behind the new British Champion, Josh Brookes (McAMS Yamaha) took seventh place – a disappointment considering his double win at Brands back in July – ahead of James Ellison (Anvil Hire TAG Racing Yamaha), Danny Buchan (FS-3 Kawasaki) and Michael Laverty (Tyco BMW) who completed the top ten. Eleventh spot went to Bradley Ray (Buildbase Suzuki), ahead of Luke Mossey (JG Speedfit Kawasaki), Gino Rea (OMG Racing Suzuki), Dean Harrison (Silicone Engineering Racing Kawasaki) and Josh Elliott (OMG Racing Suzuki) who took the final point.